We will keep you posted once we hear of any traffic delays/ detours from ACHD. August 10, 2017 – Night time lane restrictions will begin on Monday, August 14th and continue through November until the project is complete. The project covers Front St., Myrtle St., and Broadway Ave in Boise. Work will be completed at night. All lanes will be open during the day. Motorists may drive on a rough surface. Pedestrians will be detoured 24/7 while curb ramps are under construction. ITD will work to notify businesses when night time paving will temporarily block driveways (up to two hours). Some nights may require detours or flagging at signals. One lane will be open in both directions at night. Two lanes will be open at night. PLEASE PLAN AHEAD AND CHOOSE ALTERNATE ROUTES. 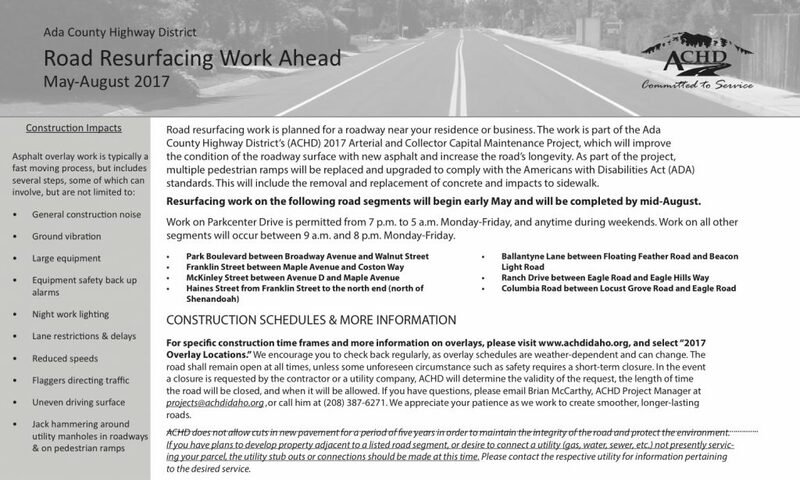 June 29, 2017 – ACHD Roadways to Bikeways Input session July 10th at 6 pm. ACHD auditorium at 3775 Adams St., Garden City. ACHD is updating the 2009 Roadways to Bikeways Bike Master Plan. The plan originally identified opportunities to enhance and expand the existing on-street bicycle network. It’s time for an update! Over the past few months, we have been working with the community to gather input on the plan’s goals and objectives, comfort rankings and bike route gaps. Now it’s time to discuss the prioritization of identified projects. Please join us on July 10, 2017 to participate in our July Bicycle Advisory Committee meeting where we’ll be discussing this update and gathering input from the community. ACHD needs your input and so do we. At the EENA annual meeting, in April, ACHD collected feedback from all of those who participated on what roads needed sidewalks, better bike access, or additional safety measures put in place. The next step was to set up some “hot spots” of where to focus their efforts. But they need a bit more feedback from you before they move forward. If you use, live by, or are affected by the following intersections then please try to attend their information collecting sessions, click here for ACHD flyer. Just look for the ACHD Commuteride Van at the specific location at the designated date/time. E. Foothills Reserve Alternate Route (includes Shaw Mountain & Shenandoah) – June 21st from 6-7 pm at Military Reserve Flood Basin Dog Park on Mountain Cove Rd. Warm Springs Ave. (from Bacon to Ave. C) – June 29th from 6-7 pm at S. Marden Street in the parking lot. If you are interested in seeing what ACHD is planning for the Bikeways Master Plan, not to be confused with the upcoming East End Bike and Pedestrian Plan, then please try to attend this meeting on Monday, April 3rd. This is a great way to provide comments to ACHD. If you cannot attend this meeting there will be others. Information and dates for upcoming meetings are on the following link –click here. Traffic Alert! Starting Friday morning November 4, 2016 Jefferson Street will begin operating as a TWO-WAY street. Jefferson will be a continuous two-way configuration from 1st Street to 16th Street….